Fox took the stage at CinemaCon, with one of the most impressive movie rollouts we've seen thus far. We saw a massive chunk of X-Men Days Of Future Past (more on that in a bit) — but more importantly, we saw the first ever clip from Dawn of the Planet of the Apes and it is absolutely stunning. Spoilers ahead. Two humans sit in what looks like a checkpoint on the outskirts of the human village. They're laying on a couple sandbags and drinking. In the not-so-far distance a singular ape approaches. The two men get tense. The ape lumbers over, the men freak out, pull their guns and scream "HEY, STOP! HEY!" The ape stretches out long raises his arms, hands-in-the-air style. He keeps coming closer. The men are scared, the giant ape somersaults and lands on the sand bags and stretches out next to the men. He smiles, they nervously smile back. The ape is aping the humans. They start to relax, the ape gestures to the bottle of booze. "You want a drink?" The ape is smiling and laughing and gesturing to the bottle. They hand him the drink, he takes a BIG swig, and spits it everywhere. The men wince, ready for ape rage, but the ape just laughs and smiles at him. They laugh and laugh. And suddenly the ape is on his feet, he has one of the guns. Still laughing, he's holding the gun as oddly as one would expect an ape to hold an automatic weapon. The men yell "whoa" — and the ape shoots one man down. The ape is smiling. He points the automatic weapon at the surviving man, and shoots. He's still smiling. It's absolutely horrifying, and wonderful. One of the other journalists at the event was completely certain that this ape was Koba, from the last movie. The ape that was horribly tortured and was very scary-looking. I'm not certain, but I will say that watching this smiling ape buddy up to the humans, laugh and then shoot them dead was chilling. Absolutely chilling. These apes are smarter than us all. First up, we get a look into the Apes new habitat. Which we've seen glimpses of before. The Apes appear to live alone, surrounded by a massive barricade of sharpened logs. And yes, they have horses, lots of them. One of the first shots focuses on an army of horse-riding apes. They look fantastic. Inside their home, you can see the beginning of ape society. A lot of familiar faces appear, Maurice the Orangutan from the previous film is there, and you see flashes of him from time to time throughout the trailer. Maurice looks sad, or concerned, he's seen counseling Caesar. 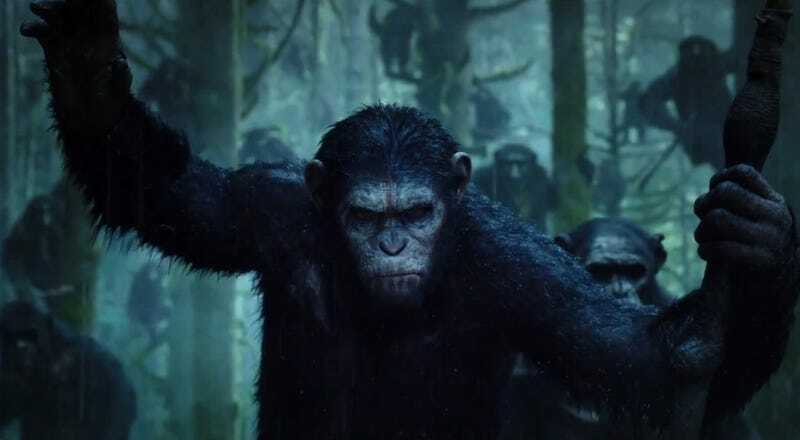 Which gives credence to the rumor that all the Apes can talk now, although the only ape we hear talk is Caesar (and he says "Apes, Family, Future." We see a family of apes gathering, playing with their babies. A lady ape and constructed some sort of bonnet made out of flowers. Life is good in the forrest for apes. But then one day, a man walks into town. Clearly these two societies have not interacted in sometime. The response is immediately negative. It's actor Toby Kebbel, he puts up his hands, he's there to make a deal. What deal, we don't know. Cut to the humans. They are not doing so well. Gary Oldman is talking to a very small group of humans over a loud speaker he bellows, "It took us four years fighting in the gutters but we are survivors." Kerri Russell counters, "It was a virus created in the labs, you can't blame the apes." Kirk Acevedo spits back "Who else am I going to blame?" Lots of flashes between actors Jason Clark and Oldman, they are clearly fighting with each other on how they should be handling the Apes. Jason is seen in a poncho trying to make contact with the Apes, clearly they need something. Oldman wants them all dead, calls the apes animals, and is seen clutching and crying a picture of two little girls (presumably his dead family). We can assume that they were either victims of the this Simian Flu (that is a major part of this movie) or they died in the many skirmishes between humans versus apes, or humans versus humans. Clark insists they don't want a war, and is heard screaming, "Don't shoot" (but of course you hear a shot). Clark and Caesar must strike some sort of deal, because they're seen talking, something happens and Clark tells Caesar he has to flee. It's all leading up to a massive load of apes, wearing war paint standing in the forest. The beginning of a war. Caesar yells, "Together Strong!"